- 5 GHz (1,733 Mbps max rate) and 2.4 GHz (600 Mbps max rate) radios, each with 4x4 MIMO support and a total of eight integrated omni-directional downtilt antennas. - 5 GHz (1,733 Mbps max rate) and 2.4 GHz (600 Mbps max rate) radios, each with 4x4 MIMO support and a total of four combined, diplexed (dual-band) external RP-SMA antenna connectors. : Ultra-fast 320 series 802.11ac Wave 2 APs offer the highest performance in high-density environments and can be managed by a Mobility Controller or deployed in controllerless Aruba Instant mode. - Four RP-SMA connectors for external dual band antennas. Internal loss between radio interface and external antenna connectors (due to diplexing circuitry): 2.5 dB in 2.4 GHz and 1.5 dB in 5 GHz. - Eight integrated downtilt omni-directional antennas for 4x4 MIMO with maximum antenna gain of 4.0 dBi in 2.4 GHz and 4.7 dBi in 5 GHz. Built-in antennas are optimized for horizontal ceiling-mounted orientation of the AP. The downtilt angle for maximum gain is ~ 30 degrees. Combining the patterns of each of the antennas of the MIMO radios, the peak gain of the effective per-antenna pattern is 2.7dBi in 2.4GHz and 2.9dBi in 5GHz. 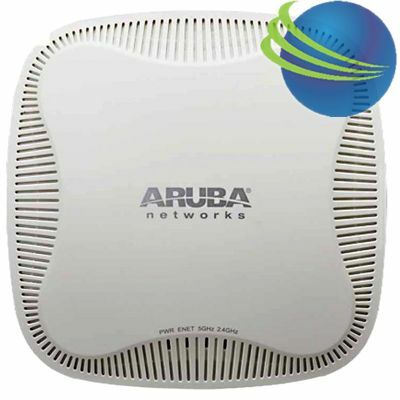 Aruba 510 Series Campus Access Points - AP-514 AP-515 Manufacturer : Aruba (HP) Model : ARUBA 510 SERIES Type : Indoor, dual radio, 5GHz 802.11ax 4x4 MIMO and 2.4GHz 802.11ax 2x2 MIMO Features : Multifunctional and affordable Aruba 210 series wireless access points (APs) maximize mobile device performance in medium-density, highperformance Wi-Fi environments. 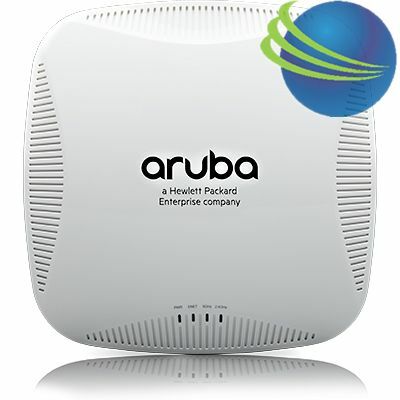 Aruba IAP-305(RW) 802.11n/ac Indoor Access Point Wifi - JX945A Manufacturer : Aruba (HP) Model : JX945A Part number : JX945A Type : Indoor Access Point Wifi Features : Multifunctional and affordable Aruba 210 series wireless access points (APs) maximize mobile device performance in medium-density, highperformance Wi-Fi environments. Aruba IAP-215(RW) 802.11n/ac Indoor Access Point Wifi - JW228A Manufacturer : Aruba (HP) Model : IAP-215(RW) Part number : JW228A Type : Indoor Access Point Wifi Features : Multifunctional and affordable Aruba 210 series wireless access points (APs) maximize mobile device performance in medium-density, highperformance Wi-Fi environments. Aruba IAP-205(RW) 802.11n/ac Indoor Access Point Wifi - JW212A Manufacturer : Aruba (HP) Model : IAP-205(RW) Part number : JW212A Type : Indoor Access Point Wifi Features : Multifunctional and affordable Aruba 200 series 802.11ac wireless APs maximize mobile device performance in medium-density enterprise Wi-Fi environments.